This week it’s all about Loooove – Loooove – Loooove (in my best Beatles singing voice) What better way to share the love then to put together a heart-felt Must Have Monday. Kisses! This is just the tip of the iceburg of the fantastic art available for purchase on Etsy by the talented EBSQ pool of artists. You can find more loved filled art by searching “Team EBSQ Hearts” on Etsy. You can additionally see more “Heart Art” by searching “Hearts” on EBSQ. Be sure to drop by our featured artists portfolio on EBSQ! : Rebecca Salcedo, Elis Cooke, and Sherry Key. 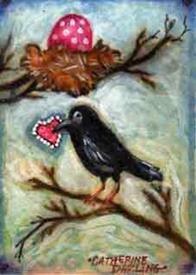 As a special treat this holiday EBSQ has a Valentine themed art gallery: Be My Valentine! From there you can send out happy love vibes to all your friends and family on Facebook and Twitter, then share it further to your heart’s content with Stumble Upon, Delicious, and Digg. If you would like to opt into Team EBSQ- Etsy just drop by and join up on our team page!